Confession time: I have a bit of an addictive personality. Thankfully it's less of the literal chemical dependency kind of addition, and more of an intense love and pursuit of a few favorite things. I often start grilling another grilled cheese before I've finished my first, I have no problem listening to a current favorite song on repeat five times in a row, and just the sound of a coke can opening makes my heart happy. It's simple joys.....Three more loves: I love surprises. I love packages in the mail. I love clothes. ....and now you can start to understand how I could get addicted. It's basically a box of clothes and accessories that are handpicked for you based on your preferences, and shipped directly to you for easy in-house shopping. Here's how it works: you sign up, fill out a style profile, pony up $20, and wait for the fashion to roll in. Yep. 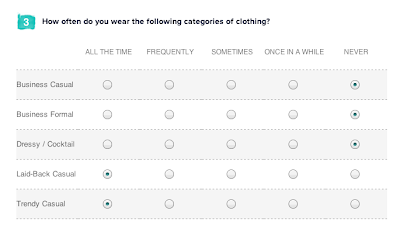 It's pretty much that simple.The survey asks a TON of questions about your style and your shape, in order to tailor your box to your unique wants and needs. 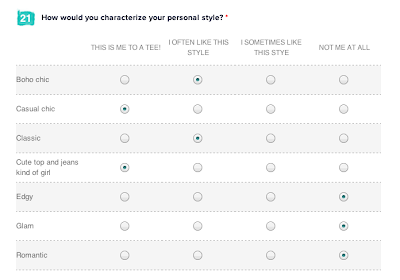 Snapshot of my style survey. After you spill your fashion guts (they ask everything from your weight to your opinion on polka dots) you schedule "a fix"- a box of five items chosen just for you! You can try everything on at home (no scary fluorescent lights), you can test things out with the rest of your existing wardrobe (avoiding the guessing game of whether this top will really go with those pants.) and there's no hassle (free shipping! no lines!). If you want to purchase something, your $20 styling fee is applied as a credit toward the purchase of anything in your box. If not, you just toss anything you don't want back in the box, and send it back (free returns!). 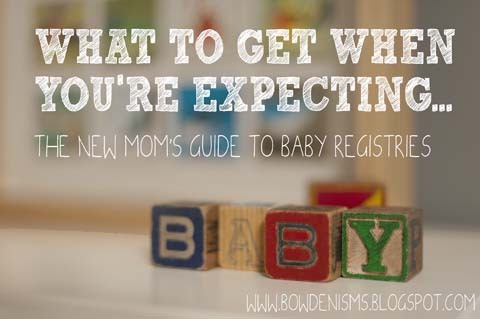 I first heard about the idea from fellow blogger and Pittsburgh mama, Kacia, and I'll admit, I was a little skeptical at first. I mean, paying $20 for what basically amounts to a blind date with clothes? (You just have to meet....I know you'll be a perfect fit....Just trust me!) I wasn't so sure..But there was something irresistible about the dress-up adventure of it all (again: surprises, mail, clothes....I'm powerless), so I took a chance. And a few days later, I got my first fix! 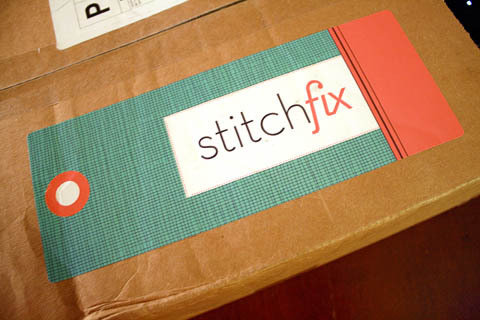 I'm pretty much like a five year old on Christmas morning whenever I get a package in the mail, so I wasted no time tearing into my box and rummaging through the tissue paper to see what treasures StitchFix had in store for me. And that's when I started to get nervous. These are bad, right? Like, not my style, not anyone's style B-A-D. 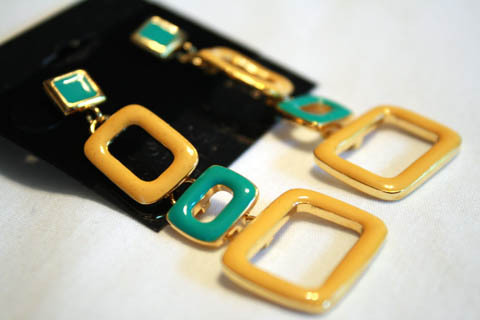 I mean, unless you count characters from the Cosby show, or elderly garage sale enthusiasts, I cannot imagine anyone wearing these. Just bad. And "out of the box" is right. This thing was so far out of my comfort zone I had a hard time even understading what it was exactly. 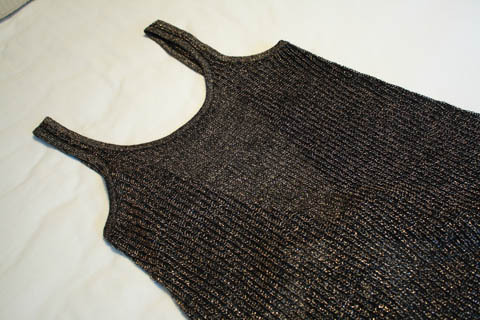 Turns out it's a black sweater-knit tank with gold thread. Oh- and it's backless. Perfect for a night out at a Steeler bar? Absolutely. Appropriate for my life? Not even close. Talk about opposite ends of the spectrum, right? One minute I'm blingin' in a skimpy sweater tank, the next I'm blanketed in four layers of navy polyester. Now, honestly, this one doesn't look so bad in pictures...but the effect in person is a bit too "Big Love meets GoGo Dancer" for my taste. 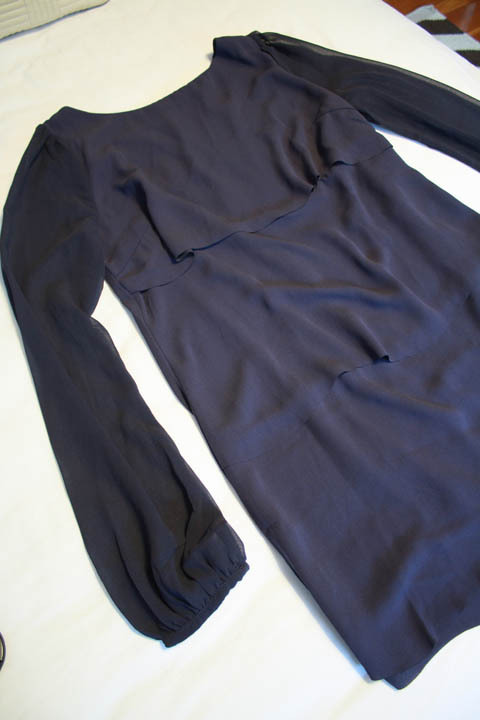 I mean- check out these sleeves! My balloon was now not only deflating, but whooshing around the room like a crazed bumble bee as my disappointment mounted. But we weren't done yet...Perhaps this could still be salvaged. Ok, stop the leak. Now we were getting somewhere.This piece wasn't hideous. Actually, it was downright pretty and it fit well, taking it light years ahead of the last few missteps. But it still just wasn't really me. It's dressier than I ever really have the need to be (but then again, I borderline wear sweatpants to work some days, so some slight gussying up wouldn't exactly kill me) and I'm not really a black lace girl. This I can work with. Break out the helium, my hope was lifting off again. Yep. This one has definite potential. It works with my style (and by that I mean: I can wear it with jeans), but it's enough of a stretch that I wasn't 100% sold right away. I think that's a good thing. A little push out of my standard fare. It's got a quirkly little hem line that may or may not make it look like I'm wearing an art smock...upside-down...But again, I kind of dig it. "We're so sorry to hear that we've disappointed you:( We really appreciate you taking the time to provide us with your feedback. 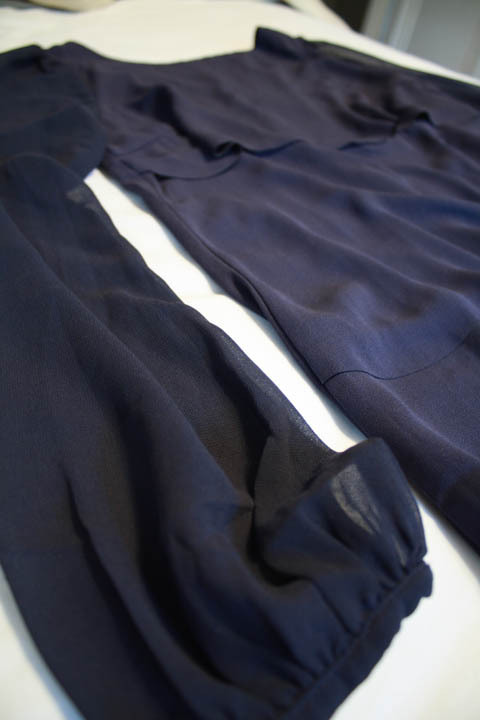 I want you to know that our stylists really do care about packing great Fixes and listening to your comments, thus I talked to your stylist to get a better idea of why she sent you the items she did. You were ranked high in boho, classic and casual and everything else had a lower ranking, so she really focused on boho casual in styling you, while giving you pieces with a funky twist (as mentioned in your notes). Maybe if you would like to provide us with a little more direction about what you are looking for? I would be happy to add as much information about your style preferences as you would like to your profile. :) Often times, information like links to pinterest profiles, stores you shop at, celebrity styles you would like to emulate and blogs all better help us in pinpoint your style. Please forward along any style preferences, aesthetics or links that can help us! Sometimes, it just takes us a try or two to really "get" your style!" See? It almost makes me forget those hideous earrings. Almost. Plus, they provide a form for feedback for every item, in multiple categories, as well as an overall rating, so that they can do better the next time. I'll definitely give it another try (addict, remember? 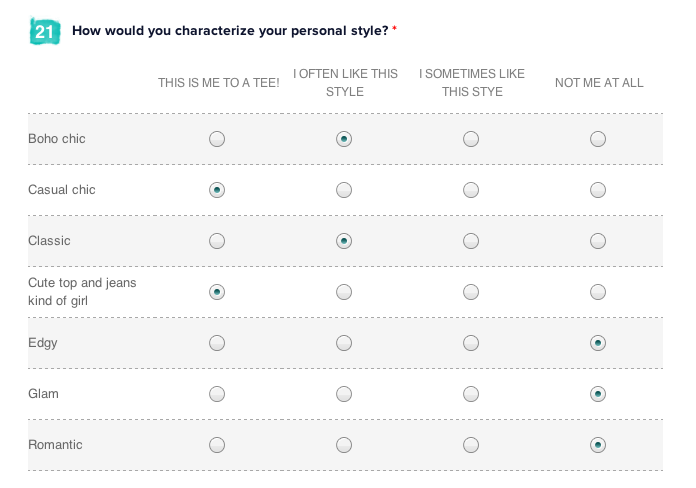 ), but I'm making some revisions to my style survey that I hope will help my "stylist" nail my look a bit more accurately. In looking back on my profile, I realized that my responses could have been part of the problem. I think I was a little worried about being too rigid and narrow-minded, so I left things a bit too open to interpretation. I didn't want to eliminate too many things because I worried I wouldn't get the best selection, but by not being totally honest, I made it impossible for them to really understand my style. Avoiding jewelry- I truly don't need any more baubles (I know...can you imagine me turning down jewelry?!) and my taste is particular at best when it comes to stuff like that, it might be better to just steer clear of that whole arena for now. Saying no to black and red. They're not always terrible for me. But they're a risk I just don't need to take. Limiting the number of categories I'm open to. It's not true that I "never" wear dressy things, but it is true that I don't need anything in that vein. Being honest about who I am. I felt pressure to sound "cool", and hoped it would help me receive more unique items in my box. But I think I would have been better off sticking more accurately to the true core of my style. Checking a box that says "Edgy" is "not me at all" doesn't literally mean I've given up all rights to be anything other than a twinset loving sorority girl. 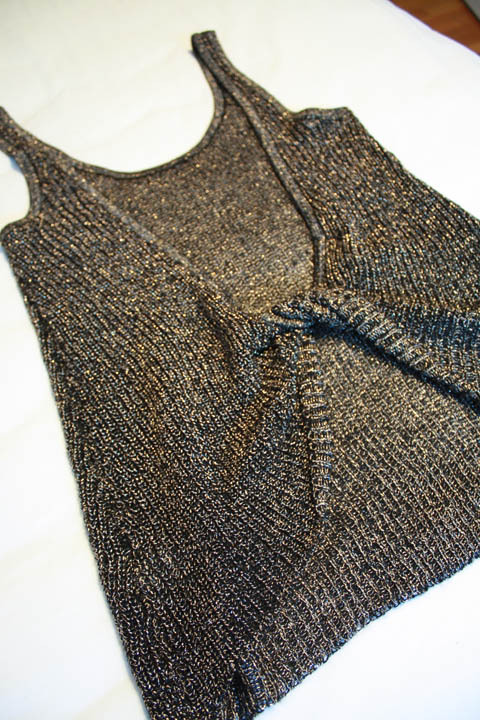 It just means they may think twice next time before sending me a backless sweater tank. 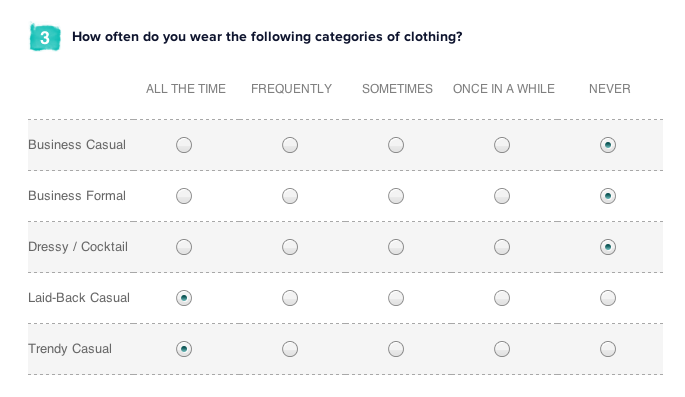 The style survey is not the final word on who I am as a woman- it's just a tool to help a stylist stranger pick out good stuff for me to have fun with playing dress up. So what about you guys? Are you intrigued? Scared? Jonesing for a "fix?" 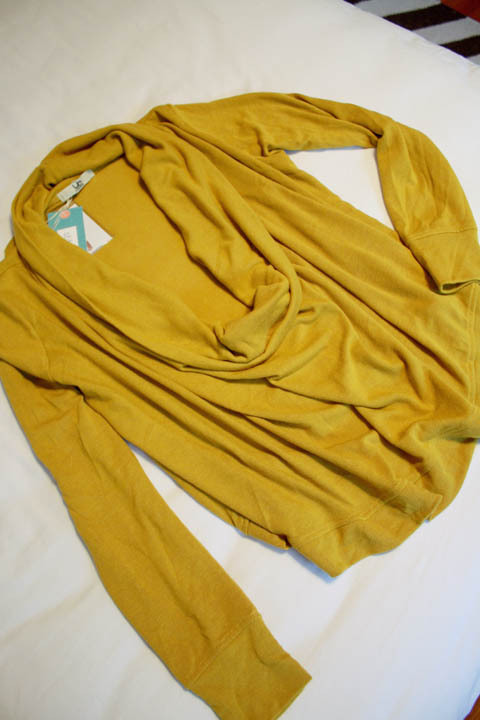 Are there any other (shopping) junkies out there looking for a quick mail order (fashion) high? Is the stylist aware of what Boho Casual means? Cos the ladies on East Ohio Street are NOT rocking Boho Cas. Are the prices of the items in the box reasonable? I saw the earrings were $28...pretty sure I wouldn't pay that much for (those particular)earrings. I really liked the top with the black lace. Not that I have a reason to wear such a top, but I liked it nonetheless. My question was the same as Rachel's. What are the prices like? 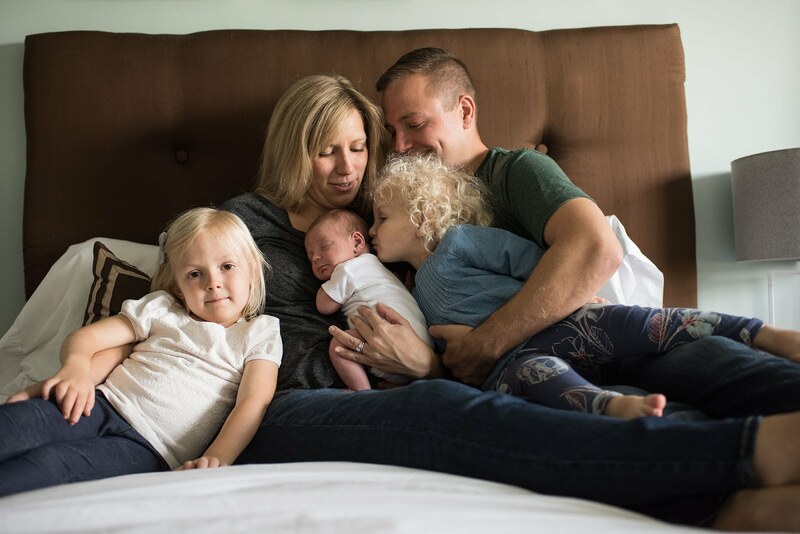 Sounds like it could be a great way for moms of little ones to shop without having to drive all over with kids in tow, if they are willing to pay for the convenience. The backless tank was more more "hobo casual" I think. Oh please post your next one!! I think you are TOTALLY right about being more defined in your profile- I felt so "mean" filling out fort first fix: no jewelry, I said "no adventure" and was super boring. So far? That one is still my fav fix! 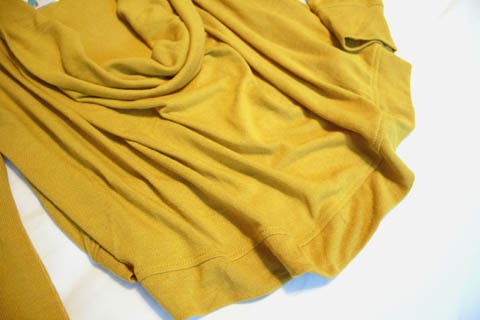 I got really detailed for this next one- and I'm asking to only get jackets/cardigans like the orange one in my last fix. 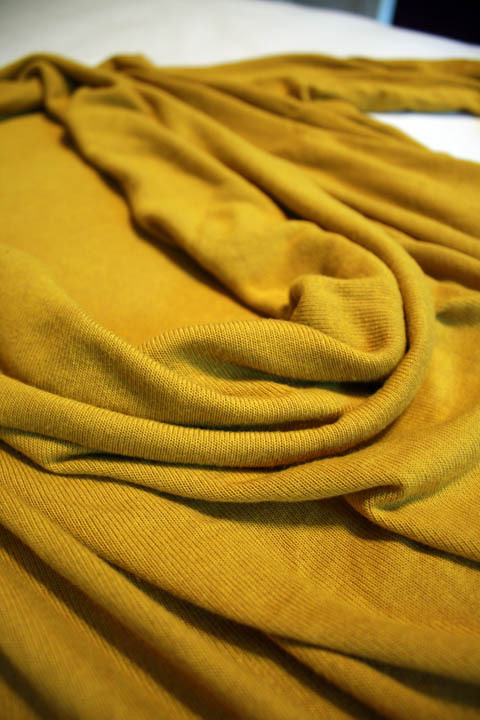 I want to find the perfect one for fall, so I thought receiving 3-5 of them would be a great way! Can't wait to see the next one. And yikes. You def. def had some strikes and misses! Sarah- maybe the HO in Boho is literal? Happy- YES- maybe they got BOHO and HOBO confused. Easy mistake! 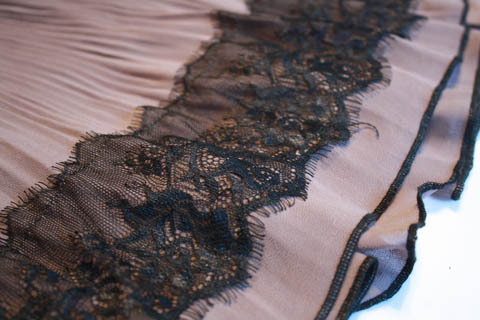 I liked the lace one too. Same struggle....no reason to wear it. Kacia- I kept thinking of your fixes and wondering when mine was going to get cute! I think I learned a lot in how to fill it out though. Your idea to make them really specific is good....I'm excited to try again. I think it'll get better if I give them more info. Brooke- I was nervous too, but I figured the worst thing that could happen would be that I would hate it all, and be out $20. But I considered it an adventure of sorts, so figured it was worth the risk. As it turned out, I ended up with 1 cute top, and a decently funny story to share. ;) Glad you enjoyed it!